Manufacturers of wearables know that fashion and smart functions can be combined to make great devices. Fossil Group has decided to collaborate again with the designer Michael Kors to create a new smartwatch for the Access line: so can technology and fashion give life to a well made product? Here's out full review! The Access Runway model MKT5046 smartwatch, made by Fossil in collaboration with Michael Kors, costs 350 dollars. Beyond just paying for all the functions, you'll also be paying a premium for that designer name. We tested the pink gold version, but there are also gold and silver versions available. The device is elegant and true to Michael Kors form . It's made of stainless steel and has the same contours as the designer's analog watches. It also integrates plenty of smart functions. It's a smartwatch that's also designed for women's wrists, although I have to admit, I found it a bit cumbersome on mine. A more compact design would undoubtedly have made it more comfortable for me to wear on a daily basis. The housing measures 41 mm in diameter, and without a doubt, it feels just like an elegant analog watch. I was impressed the first time I looked at the device, but when I held it my hand I was somewhat less impressed. Its lightness made me feel like it was made of somewhat cheaper materials. But it makes a great impression on your wrist! The smartwatch is equipped with a steel mesh strap (both brushed and polished) that can be replaced. In the box you'll also find a buckle that can be used with interchangeable straps. The round display is flanked on the right by three physical keys. The central one, which has the designer's initials engraved on it, can be rotated to navigate the system, which is a very practical function. The bottom of the device integrates the heart rate sensor and allows you to charge the device through the charging dock. It makes a great impression on your wrist. Overall, the smartwatch undoubtedly offers an elegant design, that can be made more sporty or glamorous if you choose to replace the strap. The screen measures 1.19 inches and offers AMOLED technology with a resolution of 390 x 390 pixels. The watch's display is really great thanks to the bright colors and deep blacks . It's quite readable even under direct sunlight, and you can adjust the brightness in the settings. The smartwatch offers faces that are customized by the brand and that give a taste of that Michael Kors style. You can also customize the faces whenever you want. You can even set how the face appears while you're on social media apps like Facebook or Instagram. There's an Always on display that displays the time and limits your power consumption (unfortunately autonomy isn't the strong point of this smartwatch...). The smartwatch runs on Google's Wear OS 2.0 operating system . This means that you'll find all the functions on this smartwatch that you'll find on other Android smartwatches (that includes all the imperfections). Beyond the faces in the MK app you won't find any other customization features in the software. I did, however, find an interesting function called 'My Next', which allows you to set reminders for important events (flights, birthdays, anniversaries, concerts, etc.). The navigation through the menus, either via swipes or by rotating the crown, is usually smooth, although I did encounter some crashes from time to time. In the settings menu you'll find various options, including for notifications (preview, vibrate, do not disturb mode, etc.). Everything is within reach with either a tap or swipe. Under Customization you can activate the Google Assistant, which will quickly start listening to you. You can access it either with the classic "Ok Google" command or with a swipe from left to right. All the gestures are easy and intuitive and allow you to interact with the device in a practical way. With a swipe from right to left or by pressing the physical button at the bottom you'll access the fitness functions (brought to you by Google Fit). You can select the type or training and monitor the amount of time you've exercised (based on the physical activity) as well your cardio points. The smartwatch is waterproof to a depth of 30 meters. The watch was quite accurate when it came to detecting my heartbeat, as the results were similar to my fitness tracker. The device also has GPS on board, which allows you to keep track of the distance you've traveled. It's nice to always have these functions with you, but they do seem to conflict with the real essence of the product. Personally, I'd rather put a fitness tracker on my wrist while I work out, rather than a shiny and large piece of metal. It's great that the device comes with NFC, which allows you to pay via Google Pay. The Michael Kors Access watch integrates a Qualcomm SD Wear 2100 processor that's supported by 4GB of internal memory and 512MB of RAM . It also comes with a 300 mAh battery. These are quite ordinary numbers in the smartwatch world. The performance might be better with the newer Snapdragon 3100, but in general use, the watch runs smoothly. The battery let me down. Having to recharge a smartwatch every night is unthinkable, since it means have to carry the charger with you if you go out during the weekend, since the charger uses a microUSB cable and not a Type-C. The charging dock is magnetic and the watch doesn't always correctly fit on it. During my test I never managed to get more than one day of autonomy out of the watch. In fact, the smartwatch would often run out of juice in evening before I got home. If you're used to receiving many messages on WhatsApp and want to use your device for exercising with the GPS active, you'll have to consider the limits of the battery. Samsung's Galaxy Watch and Gear S3 are much better in this regard. The good thing is that the device does recharge quickly: the battery can be fully recharged in one hour. 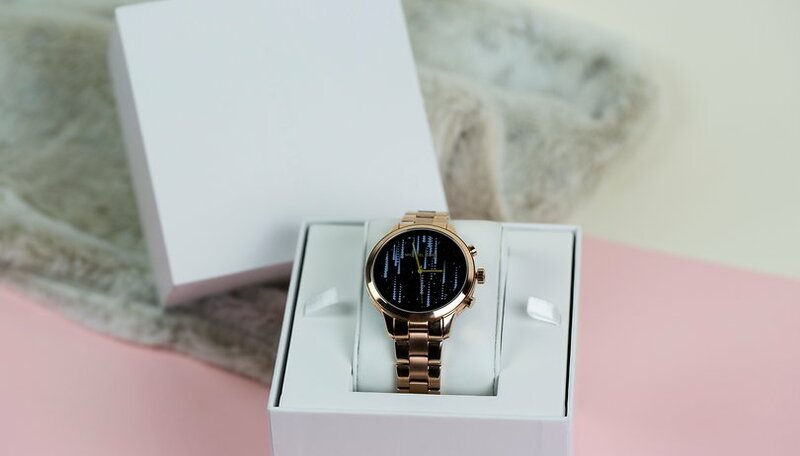 The Michael Kors Access Runway is a beautiful watch full of features. The design is elegant, it integrates interesting features like a heart rate monitor, NFC and GPS, which are not always integrated in all smartwatches. If you intend to use the smartwatch for exercising, I would recommend replacing the strap with a silicone one. You'll seem less out of place that way. All the functions for fitness lovers are there, but in my opinion the device is more geared to lovers of brand names than athletes. The battery is the device's major weakness. Of course, the Michael Kors Access Runway isn't the only smartwatch that doesn't perform well in terms of autonomy, but that doesn't make the problem any better. Although I love designer watches, I personally wouldn't spend so much on this device or other comparable models. I'd rather have a watch that is still on in the evening. What do you think of this smartwatch? That's not a micro USB charging lead. It looks like a standard USB A plug. Having said that, they do need to get a longer battery life to make these watches really practical.